Dreambox DM500s is one of the famous Linux based decoders that can be used to decode satellite signals from the sky. And if for any reason you would like to reflash your Receiver DM500s either due to software instability, unable to access the setting due to password locked or simply want to get a newer version of firmware, here is a simple step that you can follow to get it done. For the start, make sure you have Ethernet cable connecting between your PC and DM500s. Then, go to access the Menu option on your decoder. Enter Menu, followed by Setup -> Expert Setup -> Factory Reset and click ‘Yes’ will reboot the system. After rebooted, again go to Menu-> Setup -> Expert Setup -> Communication Setup. This will read and display the Dreambox IP Address that you will be using it when trying to flash the decoder later. 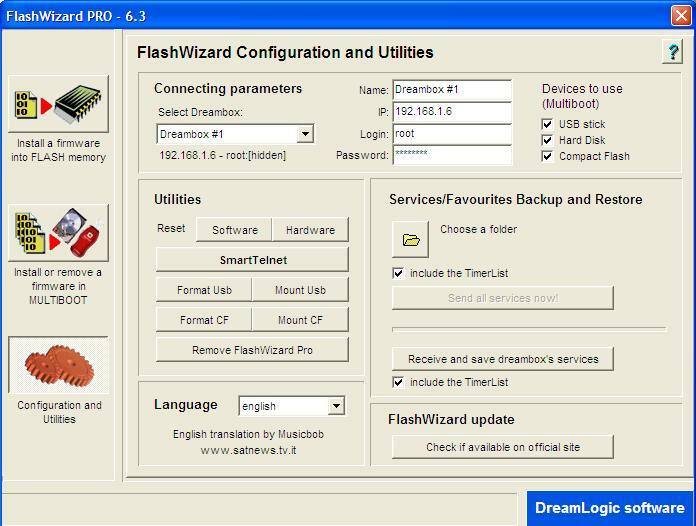 On your PC, launch FlashWizard Pro (assuming that you have download it and save in local PC), a powerful firmware installer that can be used to reflash any Dreambox systems. For the start, go to ‘Configuration and Utilities’, key in the IP address of the Dreambox with default Login and Password as ‘root’ and ‘dreambox’. After that, click on ‘Install a firmware into FLASH memory’ button will open another new interface and over here, users can browse for the firmware file (.fw2 format) by opening the yellow folder button and double clicking on the firmware file and click yes will load and flash the new firmware into it. It may take few seconds to minute for the flashing process and once a successful message is pop up, just reboot the DM500s for it to be effective. Hopefully these simple steps will help you recover your Dreambox system without the need to send it back to repair center which could be time and cost consuming especially for those that are out of warranty period.